Please refer to our stock # R20 when inquiring. 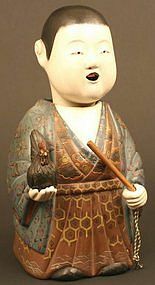 18th Century Edo Period Saga Ningyo of a young boy holding a rooster in one hand and a scepter in the other. His head bobs while his tongue goes in and out. Carved entirely of wood, his robes are built up with pigments in a technique called 'moriage'. He has a gorgeous blue outer robe decorated with foliate scroll slightly raised in relief. His inner robes are brown with shaped roundels of geometric patterns and cloud shapes. This rarest of all Ningyo forms almost never comes up for sale and are almost never seen except in museums or important private collections. Saga Ningyo are considered the "holy grail" of Ningyo. They were first produced in the early 17th Century. 10.75 inches (27cm) tall. Fine condition with original box and documents.